Belting questions ranging from Fools Gold to Flowery Twats. The Picture Round is about Famous Last Words and the Wild Card is a ridiculous stat about coffee production. Q03. In 1844 who wrote the famous short story The Ugly Ducking? Q13. Which Australian singer featured in David Guetta’s 2012 number one Titanium? Q24. In 2013 which team did Chelsea beat 2-1 to win the Europa League final? Q34. Who replaced Kylie Minogue as a judge on BBCs The Voice?? 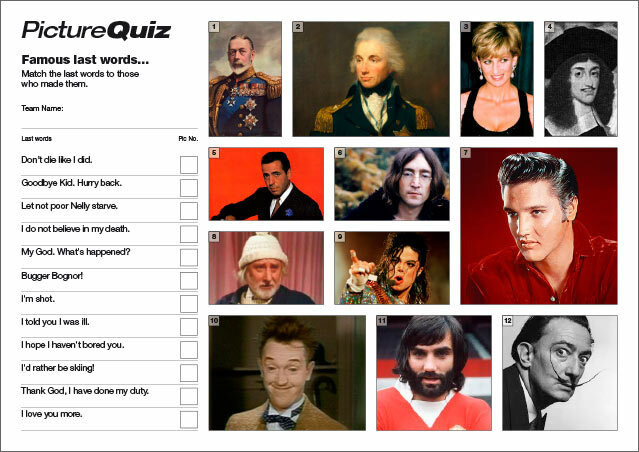 Quiz 27s Picture Round is match the famous people with their famous last words. The Wild Card for Quiz 027 is a crazy stat about the coffee production of Vietnam!